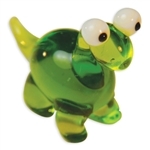 Dinosaurs - Looking Glass Online Shop - Highly detailed collectible hand-crafted glass sculptures of everything from Doggies to Dragons, Animals, bugs, Birds, Ocean Creatures and more! Spike the Stegosaurus loves to play darts with his buddies. He has great aim and coordination. Spike loves to help others and dedicates much of his time towards volunteer work. He’s well known in the community and friendly with everyone he meets. Lime green is his favorite color and he enjoys eating big, fresh salads. Spike was born April 21, 2009. Razor the Raptor likes to play leap frog with friends. He loves to listen and dance to pop music for hours on end. Razor’s favorite time of the day is bed time and he writes in his journal every night before going to sleep. One of Razor’s fantasies is to live on a deserted island and build a tree house for himself. Razor’s birthday is February 24, 2009. King the T-Rex is the teacher’s pet. He was voted, “Most Likely to Succeed” by his peers because he always gives 110% in all he does. King may seem very confident, but he constantly needs affection and reassurance. He loves to please others and unselfishly places his loved ones’ needs before his own. King’s birthday is January 3, 2009. BigTooth the Triceratops is very self conscious about her looks. She gets teased a lot for her big chompers and therefore gets nervous when meeting new dinosaurs. One of BigTooth’s favorite things to do is sit around and play Sudoku. She’s a proud vegetarian and loves to eat broccoli. BigTooth’s birthday is October 3, 2009. Bruno the Brontosaurus loves to roam the countryside and pick flowers for BigTooth the Triceratops, who he is secretly in love with. He also likes to discover new watering holes to drink from. Bruno’s favorite activities are sunbathing and swimming. Bruno likes to celebrate his birthday with fireworks; he was born May 5, 2009. Russ the SpinoSaurus is from the coast of Northern Africa. He has the ability to live on land and in water. The name, SpinoSaurus actually means “Spine Lizard”. He is the largest of all carnivorous dinosaurs. Russ loves to roam the desert plains with his family members. He also enjoys swimming in the ocean to cool off after a day in the heat. He was born June 10, 2010. 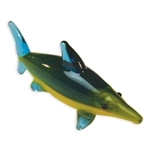 Isaac the Ichthyosaur is a giant sea-dwelling dinosaur that resembles Dexter the Dolphin. Isaac was built for speed which helps him catch squid during his midnight hunts. The heyday of his species was during the Triassic period when there was bountiful food to be caught and few predators to be weary of. Isaac was born January 29, 2012. Mario the Mammoth is an intimidating, large creature. He is so gigantic that his name has become synonymous with the word massive. Mario is covered in long, shaggy hair and equipped with two curved tusks. 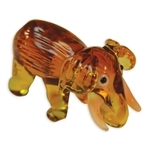 He is very similar in appearance to Ella, the elephant who is a distant cousin. Mario was born May 30, 2012. Brock the Brachiosaurus is rather like a giraffe in that he has an incredibly long neck. Because of his stretched proportions, Brock can easily graze on the foliage of trees that reach 30 feet off the ground. Brock is so tall he has earned the title of “the largest dinosaur”. Brock was born under the frond of a tree fern on February 19, 2012.